A significant study, entitled “Environmental Study for the Installation of Aeolian Parks in the area of the Pyrga village”, has been prepared for the creation of Aeolian Parks by the Department of Environmental Management and the Department of Mechanical Engineering of the Cyprus University of Technology*. An effort to present some data of the study which has been based both on international know-how and bibliography, as well as on actual data taken from the area in question, will be made below. At this point, it is worth mentioning that the purpose of this study was to examine the potential environmental and social consequences that might arise from installing the Aeolian park in the village area. Although there has not been an installation of Aeolian Parks in many areas, however, “the topographic and social conditions appear to favour their evolution” (p.2). The creation of Aeolian Parks is linked to the need for exploiting renewable energy sources such as the Aeolian, since “conventional energy sources” such as oil have, on the one hand, decreased significantly, and on the other hand, the produced pollutants “from burning conventional energy sources have reached very high levels with very evident catastrophic consequences” (p.1). Conventional energy sources or mineral fuels are oil, coal, and natural gas. Every material extracted (pumped) from the bottom of the earth and is of energy value (can be burned) constitutes fuel” (p.3). Renewable energy sources are the “forms of exploitable energy that derives from various natural procedures” (p.9). For example, renewable energy sources are the Aeolian energy, sea wave energy and solar energy. Renewable energy sources are “inexhaustible energy sources” (p.9), which are, contrary to conventional energy sources, environmentally friendly. Researchers distinctively write: “the main characteristic and advantage of the RES (Renewable Energy Sources) is located on the fact that they contribute in withdrawing from conventional energy resources with minimum environmental consequences and at the same time constitute an indigenous energy source, this way contributing in decreasing dependence from imported oil and at the same time reinforce the safety of energy supply (p.10). The use of renewable energy sources instead of alternative non-renewable energy sources, such as natural gas, not only does it limit the problems of oil reserves, but it also “eliminates any environmental consequences that arise from the use of mineral fuel” (p.9). Aeolian Parks exploit Aeolian energy, the energy produced by the blowing wind. At this point it is worth mentioning that present technology is in a position to exploit kinetic energy in such a degree that can “cover twice the needs of humanity in electric power” (p.12). Researchers explain that a system of Aeolian energy can transform the “wind’s kinetic energy into mechanical or electric”. For instance, this energy can be used to charge batteries or a “hybrid system for the provision of electric power” at a location where there is no electric power (p.12). The benefits that result from exploiting Aeolian energy are, apart from environmental, social and politico-economical. Aeolian energy is a “mild” and “clean” technology which produces electric power and does not “burden the local environment with air pollutants” such as carbon dioxide and carcinogenic micro-particles which are produced by conventional energy stations (p.12). As it is well-known, our planet is under threat by the climatic changes which are mainly linked to the “gradual increase of gases and which cause the greenhouse effect” (p.10). Within the line of the Agreement for Kyoto Protocol, several countries are obligated to reduce the emission of harmful for the environment gases which cause the greenhouse effect. Researchers complete that “effective treatment of climatic changes” requires both the use of renewable energy sources and energy saving (p.13). And they explain: “each kilowatt-hour produced by conventional stations pollutes the atmosphere with greenhouse gases. This means that not only is the greenhouse effect not intensified, but also that there are no negative consequences in public health by the atmospheric pollution” (p.13). New job positions are offered. More specifically, “1 MW of Aeolian Energy exploited”, corresponds to ten new job positions (p.14). A large part of the Aeolian Park’, meaning above 90% of its land, can be used for other activities, for example agricultural works. They can be exploited as sights, something that can help the area financially. In Germany, for example, the Aeolian Parks have been transformed into works of art, since the wind turbines are placed in such a way that they form a bridge. The increase, at least in some occasions, “to the growth rate of the neighbouring areas and to the value of the neighbouring estates” (p.14). The most important politico-economical benefits from exploiting Aeolian energy are that this is provided for free, that “an important amount of conventional fuel is conserved, something which means that the state has significant commercial benefits”, and also that it reinforces “our energy independence and safety, which is a very important element both for our country and Europe in general” (p.13). To sum up, Aeolian energy constitutes a sustainable energy solution which contributes in withdrawing from “geopolitical dangers, external energy dependence, energy imports, fuel expenditures, fuel price rise dangers, drillings, pumping/extracting, refineries, pipelines, reserve limitations and CO2 emissions (carbon dioxide)” (p.15). In 1998, the installed power potential of Aeolian Energy at a global level was over 10 000 MW, whereas at the beginning of 2008 it was above 100 000 MW. What is worth mentioning is that the global installed power potential of Aeolian Energy is expected to rise up to 160 000 MW by 2010, and that “more than one third (34%) of global electric power consumption will be covered by Aeolian energy” by the year 2050 (p.23). Should this objective be achieved, “the emission of 113 billion tons of carbon dioxide will have been prevented” (p.23) by the year 2050. Europe is first in production of Aeolian energy with a percentage of 59% followed by the USA with 18.9%, Asia with 16.5%, the Pacific Ocean countries with 2.68%, Canada with 1.8 % and Latin America and Africa with 0.54%. Wind Turbines: the machines that convert Aeolian energy into electric energy. An Aeolian Park consists of many wind turbines which are installed in areas with a high Aeolian potential. A medium wind turbine can produce “6 KWh per year, meaning a production which equals to the annual electric power consumption of 1600 European households” (p.16). What is noteworthy is the fact that the “latest generation of wind turbines has a wind turbine power between 1000 and 6000 KW” (p.16). Each wind-turbine must be at least 3 to 9 diameters of the wing away from each other. Additionally, wind turbines are installed according to the wind direction. In particular, if the prevailing winds direction is the “west, wind turbines can be installed very close to each other towards the directions which is vertical to wind direction” (p.16). Tower: It is made of steel and has the shape of a cylinder. It usually consists of two or three parts which are connected to one another. Placed usually on the base of the tower is the transformer which “converts low voltage current into medium voltage so that electric power can be transferred towards the EAC network (poles) and from there after into low voltage again at the substation of the area” (p.17). Control chamber or box: A chamber consists of the “main axis with the brake system, the gear box and the electric generator” (p.16). Electric control systems: The control systems aid the secure operation of the wind turbine. Each system consists of at least one or more microcontrollers or microprocessors. Wings: Made of glass fibres and special resins which are “designed to withstand great strains” (p.17). As it is concluded from the aforementioned, a wind turbine is a “simple technology” which does not jeopardize “either the safety or the health of humans” (p.17). The energy or else power produced by each wind turbine depends on the density of the air, the cube of the wind’s speed and the technical characteristics of the complex. As far as the wind speed is concerned, this “increases as the height increases, and therefore wind turbines are always installed on the top of high retaining towers” (p.17). The electric energy produced by the wind is “discontinuous” because it is depended on the intensity of the wind (p.17). The same happens with the demand for electric energy which is diversified, for example, by the time of the day and the season. This results in “significant power oscillations”, as well as spans, when the production of electric power completely stops, either “when there is wind-lull or very strong wind” (p.17). As it is concluded from the above, an Aeolian park has to have provision for energy storage in order to be autonomous, and for this reason “accumulators are often installed” (p.18). Analyzed in the study are the environmental impacts that may arise from installing Aeolian parks in the area. As far as the impacts on the fauna are concerned, European studies have shown that wind turbines “do not pose a significant problem for the animals” (p.24). More often, birds are killed after colliding on buildings or means of transport and not by colliding on wind turbines. In particular, while 1500 birds are killed by hunters and 2000 after colliding with electric lines or vehicles, only 20 birds are killed after colliding on a wind turbine. Another issue presented in the study in relation to the impacts caused by the installation of Aeolian Parks is the “aesthetic alteration of the space and the impact on the natural landscape” (p.27). The most usual accusation that wind turbines are charged with is that they dominate the environment”(p.27). Naturally, this accusation is subjective. What is interesting is that Aeolian parks are “more aesthetically acceptable” by people who are informed on the benefits of the parks. This was designated by a study which was conducted in European countries. One of the problems caused by the installation of wind turbines is noise pollution, which can easily be “controlled and prevented” (p.25). The noise produced is divided into two categories; the mechanical which derives from mechanical parts and the aerodynamic which derives from “the rotation of the wings” (p.25-26). Both the mechanical and the aerodynamic noise have been reduced thanks to the new design of the wind turbines. The noise varies from 35 to 90 Db according to distance. It must be noted that the noise produced by modern wind turbines is barely detectable in a distance of 200 metres, whereas it is much less than the “background noise of a small country town” (p.27). Considering that law provision constitutes the installation of wind turbines in a minimum distance of 850 metres from residential areas as obligatory, then it can be easily concluded that disturbance is minimum. In particular, the noise level corresponds to the one of a “quiet living room” (p.27). Aeolian parks not only do they not burden stock breeding, but on the contrary, they attract goat sheep and cows which enjoy the shadow of the wind turbine towers. As far as agricultural activities are concerned, these are not obstructed by the installation of Aeolian Parks since 99% of the land situated in the production area does not cease being “available for other usage” (p.28). The first wind turbines used to cause problems of electromagnetic interference. The wings are the ones which can affect radio waves, television and mobile phone signals. Hence, modern wind turbines have wings which barely affect the transmission of electromagnetic interference. Additionally, specialists underscore after an analytic explanation that “everything argued in relation to the emission of radioactivity and electromagnetic radiation by wind turbines is not valid” (p.29). The location selection for the installation of the Aeolian Park in Pyrga was made based on the suitability requirements from an “environmental point of view” (p.31). Summarized below are all the data recorded by researchers in relation to suitability. In particular, the Park is 2.5-3.0 Km away from the housing zone and is located east of Pyrga and west of the Stavrovouni Monastery, on the “Apiattsi” hill, also called “Chorteri”. The longest distance between a wind turbine and the last legal residence in 1.5 Km. This particular residence falls outside the housing zone and “has a noise level of 35-40 dw (background noise)” (p.31). Additionally, the Aeolian Park of Pyrga falls outside the protected area. In particular, the area of Pyrga which is protected by the Natura network on the mountain peak of Stavrovouni is 4 Km away from the park’s installation area. Apart from this, the Aeolian Park was neither installed in an area with cultivable pieces of land, nor in a location where it will alter the “aesthetic image of the area” since the wind turbines and the E.A.C posts “will be installed in the rear side of the mountain” (p.32). During the Aeolian Park’s construction phase, serious effects on the environment could be prevented after “careful study” (p.33). The installation of the Aeolian Park will constitute Pyrga as one of the “green communities” which promote environmentally friendly technologies (p.32). Another benefit for the community is that the installation of the Aeolian Park will result in upgrading rural roads, while some of them will be expanded. The Aeolian Park’s location of installation “does not fall within or close to a migratory birds’ passage” (p.34). Therefore, the possibility of causing destruction to the fauna is minimum. Additionally, no electronic interference or noise pollution problems are caused by the wind turbines. As far as noise pollution is concerned, this will not pose a problem since the Aeolian Park is a long distance away from the village. Only during construction period is there a possibility of “minor noise problems”, which might arise due to the movement of “the construction company’s vehicles” (p.35). “The environmental destruction by the constant extraction and usage of mineral fuel has reached highly dangerous levels”. The oil reserve stock has decreased dramatically during the last years. Finding and using renewable energy sources is extremely necessary for the survival of the planet and the human species. Wind is the cleanest and mildest renewable energy source on the planet. The improved design and the development of modern wind turbines have in essence eliminated the problems caused by old type wind turbines (e.g. noise). The town planning permit of an Aeolian Park considers all possible parameters which can affect the environment, the health and the quality of people’s life. The chosen area is totally suitable (from an environmental point of view) for the construction of Aeolian Parks. There is no sign to indicate that the creation of Aeolian Parks affects the value of neighbouring estates negatively. There are indications (other countries’ experience) that the value of estates neighbouring Aeolian Parks is in no way affected or that it increases slightly. There are indications (other countries’ experience) that the growth rate of the areas located in a close distance to Aeolian Parks increases after the creation of the parks (agrotourism). We therefore ascertain that the installation of an Aeolian Park in the Pyrga area is not expected to create particular environmental problems and the community can move ahead and approve it. 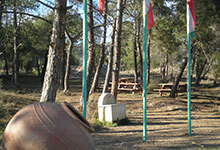 The competent state services certify that the area meets all legal criteria for the installation of Aeolian parks. Possible consequences that might be caused by wind turbines are on the one hand directly “visible”, and on the other hand it is possible to be limited with the right encounter and planning. Since the production of electric power constitutes an imperative need, we will have to make sure that its production method causes the least possible burden for the environment. Both from a technological and a financial point of view, the most mature form of clean and renewable energy is considered to be the Aeolian. This can effectively contribute in preventing climate changes by offering at the same time a variety of environmental social and financial benefits” (p.39-40).